Our last full evening in Portland was Saturday night. While Portland might not be as big of a city as Los Angeles, it’s still a Saturday night which means if we want to find a good place to have dinner, we still need reservations. Making reservations means a little research needs to go into looking for an appropriate restaurant to dine at. The restaurant my husband eventually suggested was located right in downtown Portland. In fact, the restaurant is located on one of the top floors of one of Portland’s tallest buildings, meaning the view was going to be spectacular. I thought this would be the perfect setting to cap off our holiday trip to Portland. When I made the reservations, I specifically requested that we get a window seat so that we could enjoy the view. We arrived at the restaurant on a somewhat breezy and rainy Saturday evening. By the time we made it up to the floor where the restaurant was located, we found that the dining room and bar area were packed to the gills. In fact, while waiting for our table, one of the other guests I was speaking to had raved about how wonderful the food was and how it would be worth the wait. I was excited! The only drawback when we arrived was that the hostess noticed our request for a window seat, but had told us that if we really wanted a window seat there was a bit of a wait as none of them were quite available yet. However, if we wanted to be seated right away, we could, just not at a window seat. Considering the fact that we’d never been to this restaurant before, we really wanted the view, and we were pretty sure we’d never be back again, we told the hostess that we’d be willing to wait for a table seat. In the end, the wait was almost an hour past our reservation time to get the table we wanted. Let’s see if the setting, the view and the food would be worth it or not. 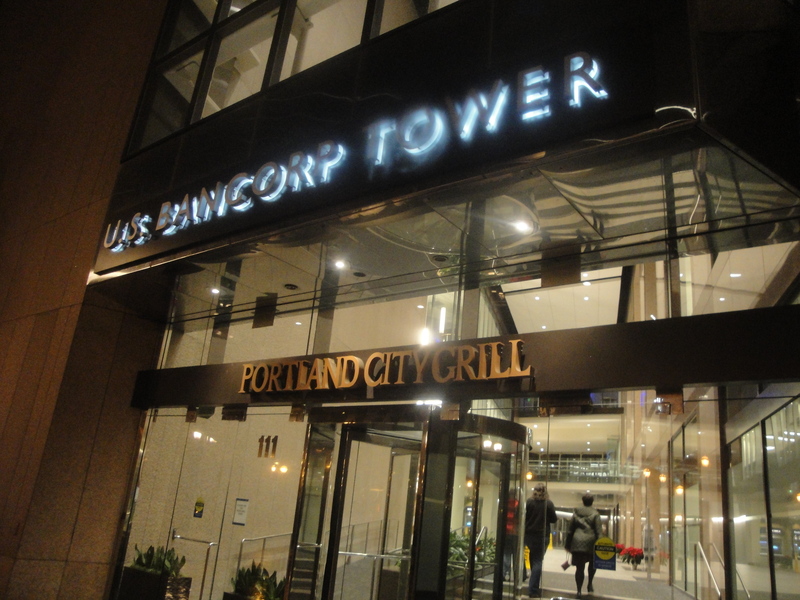 Portland City Grill, located on the 30th floor of the US Bancorp Tower in downtown Portland is an award-winning restaurant that specializes in steak and fresh seafood and a very lively happy hour. With a menu that specializes in food prepared with a Northwest flair as well as Island and Asian influences, Portland City Grill is the perfect place to dine out on special occasions or even for business meetings as it offers a little something for every one. The night we were at the restaurant, the bar was hopping with a very lively crowd. Being located in the heart of downtown, but in one of Portland’s tallest buildings, one of the restaurant’s most stunning features is it’s unrivaled views of Portland as well as the nearby Cascade Mountains. We arrived well after the sun had set, but that didn’t deter from the view of Portland’s city lights laid out below us. The scenery was fantastic, and the view was well worth the wait for the table. The setting and atmosphere of the restaurant was intimate and private, and though the dining room was expansive, it didn’t feel crowded. After an hour of waiting to eat, my husband was ready to order a cocktail off of the restaurant’s drink menu. After perusing the various drinks, my husband ultimately settled on an Old Fashioned. Made with Bulleit rye, sugar cubes, fresh muddled oranges and peach bitters it was the bitters that caught my husband’s eye. After tasting his cocktail he really liked it. He described the drink as tasty. The drink was a bit fruity and citrus flavored, and a bit on the sweet side with the sugar cubes, but it was a good mix. 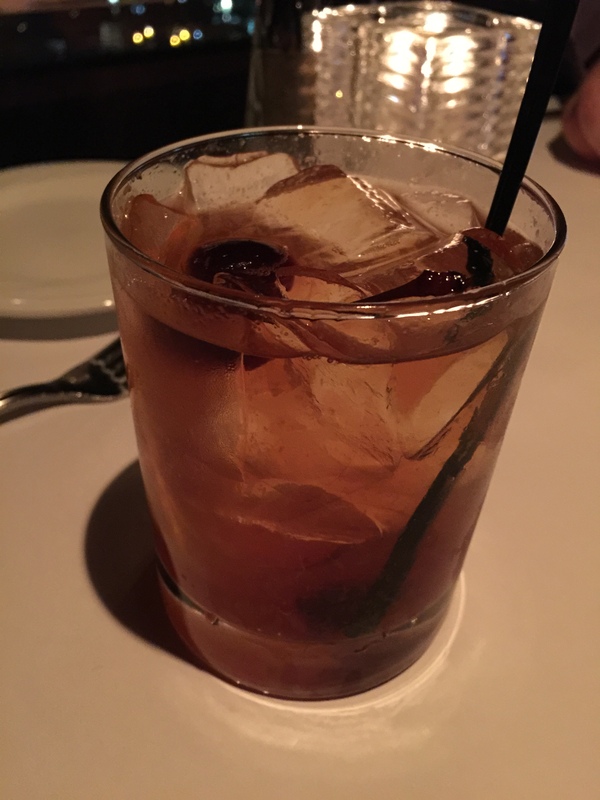 He conceded that ordering an Old Fashioned may be his new go to cocktail at restaurants when we go out in the future. By the time we sat down and ordered, I was starving, so I decided to order a salad to start my meal. 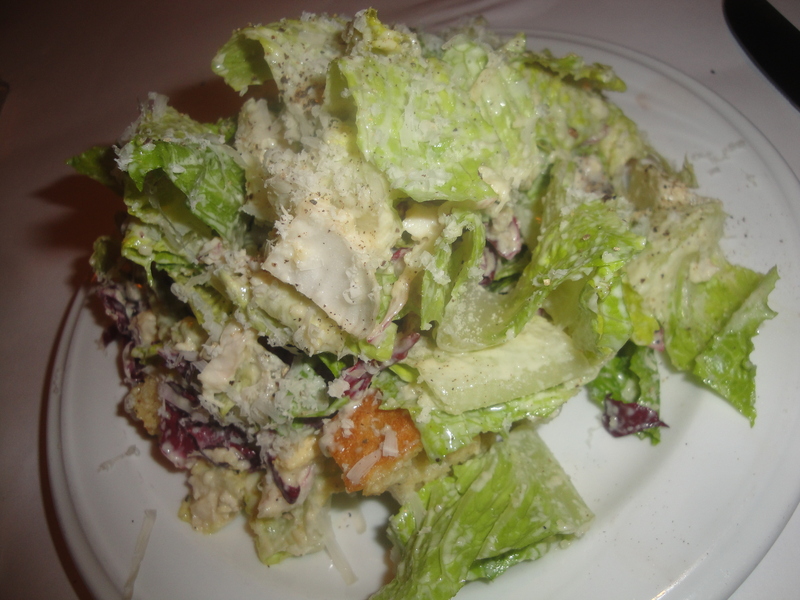 The chophouse Caesar was my choice, as I’m a huge Caesar lover and I always like to see the different ways Caesar dressing is prepared because no two restaurants who make their own Caesar dressing ever prepare it the same way. I’m more a fan of the thick, creamy Caesar dressing, and for me, I have greens with my dressing, as in, I like a lot of dressing. Portland City Grill delivered. Thick, creamy Caesar dressing that stuck like glue to the Romaine lettuce, though they called it a lemon Dijon vinaigrette on the menu. The idea of finely grated parmigiano-reggiano cheese on the salad also worked well and the flavors of the salad dressing were really good. Finally the addition of a bit of radicchio with the Romaine was different. I’m not normally a fan of radicchio as it can be really bitter, but in this salad with the strong Caesar dressing, I actually liked the little notes of bitterness in the greens. We just had to start with some appetizers to tide us over, besides the fact that the menu was so varied and there was so much to choose from. In the end, my husband and I couldn’t quite agree on an appetizer to share, so as is the norm for us especially when we’re traveling, we each order our own dish. It’s the phenomenon of feeling like this is the only time you’ll ever eat at this restaurant, so why not go all out and try the things you want to try? Dangerous philosophy sometimes. My husband, who seems to be really into duck dishes recently decided to order the five-spiced Peking duck and steamed buns. This was Portland City Grill’s take on the classic Peking duck, but instead of sliced duck meat with the crispy duck skin, what you get with this dish is a duck confit leg. Served along with sesame Hoisin sauce and a side of kimchee this dish was a bit Chinese, a bit Korean, and I guess a bit Pacific Northwest? It was just different. I’ve never see Peking duck served with kimchee before. My husband’s initial reaction was that he thought that the meat should have been taken off of the duck leg to make it easier to access rather than having to pick it off. However, he said that point became moot since the way the duck leg was prepared, the meat fell right off the bone. The meat of the duck leg was moist, tender and delicious. Take a bit of the duck meat, some of the sesame Hoisin sauce and load it up with some of the green sprouts into the steamed bun, the bun tasted delicious. 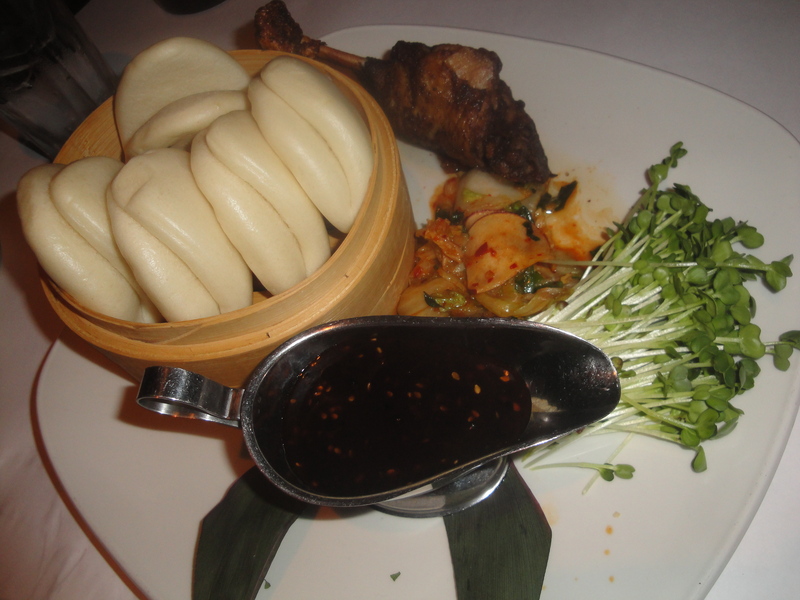 The sesame Hoisin sauce was a bit sweet and a bit messy and sticky, but was a perfect match to the steamed buns and duck meat. My husband added a bit of the kimchee to his buns and he liked the contrast in flavors. For him, this was a terrific appetizer. He would have taken this exact dish as an entrée if they had offered it. I guess keeping with the Asian flair of the menu items, I chose to order the crispy shrimp & crab roll. According to the menu description, the crispy shrimp & crab roll was made with a soy paper wrap, stuffed with avocado. That was all that was in description. I assumed that the only other ingredients would be crispy shrimp and crab, so a roll of some sorts, but not quite sashimi. 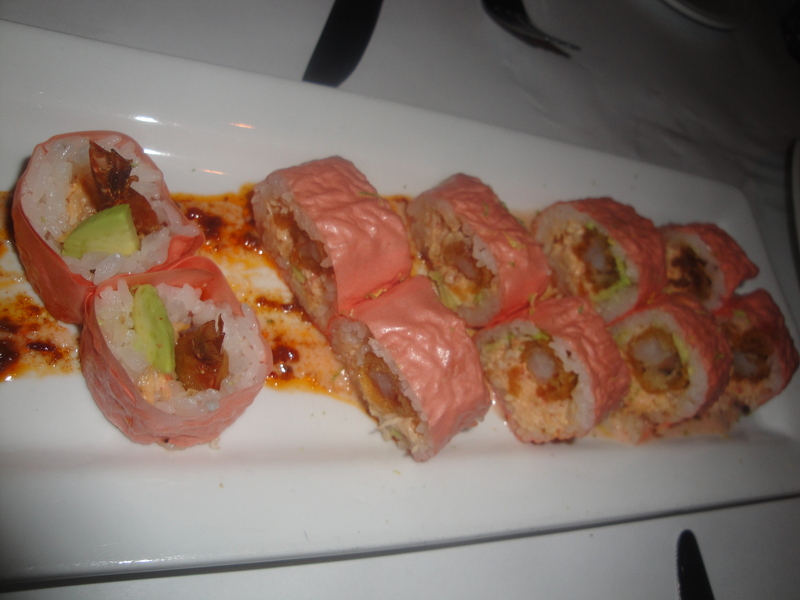 I was a bit surprised when the dish was brought to the table and I realized that the soy paper wrap was pink in color. Definitely not what I was expecting. To add flavor to the dish, the cut roll was sitting atop chili oil that had been spread on the dish. As soon as I saw the chili sauce, I was a bit wary as I knew I wasn’t going to love the spice factor. And I was right. The chili oil and the chili flakes were hot, a little too hot for my tongue, so I found myself trying to scrape off what I could. However, the crispy shrimp & crab roll itself were fabulous. Absolutely tasty. The crispy shrimp provided a nice crunchy texture to the roll and the flavor of the deep-fried shrimp was sweet and succulent. The creamy avocado was a nice compliment to the sushi rice and the crab mix. Even the soy paper wrap itself wasn’t to so bad. If not for the chili oil, I would have really been in love with this dish. As hungry as I was before we sat down, after my Caesar salad and my crispy shrimp & crab roll, I was actually quite full and a bit worried about the entrée I ordered as I knew I was going to have some trouble finishing it. Oops! I guess I wasn’t quite as hungry as I thought I was, or I was more full to begin with than I thought I was. And unfortunately, I ordered a very heavy entrée too. My selection was the shallot soy glazed beef short ribs served with buttermilk mashed potatoes, roasted tomatoes and pan jus. The soy glazed beef short ribs were double the size that I had expected them to be and considering that I was already getting full, just seeing the size of the short ribs made me that much more full. The ribs were incredibly tender, like for tender, and pretty much fell apart on their own, which was fantastic. The soy glaze gave it a nice salty flavor and with the pan jus the flavor of the short ribs was fantastic. This was the type of dish I was looking for when I decided to order the short ribs. The tangy buttermilk mashed potatoes were a perfect compliment with the soy glaze of the short ribs. Add the pan jus to the buttermilk mashed potatoes and you have a total winner that I’m a complete sucker for. I polished off the mashed potatoes and tried to stuff as much of the beef short ribs into my mouth as I could. This was an excellently prepared meal. With Portland City Grill’s reputation as a top notch steak and seafood restaurant, my husband decided to try both of them for dinner and ordered a surf and turf dish. 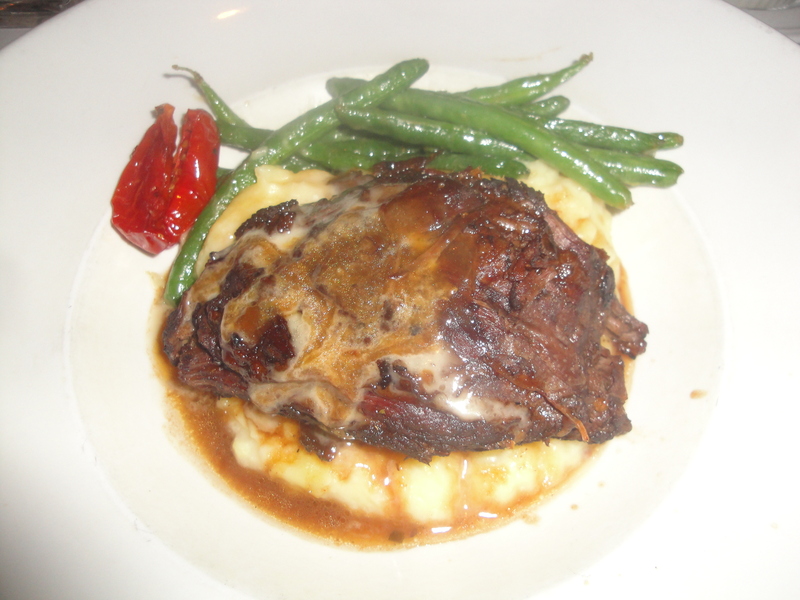 The turf was a rib eye steak from Omaha, 36-day aged. The surf was an herb butter roasted 12 oz. lobster tail. The entrée was served with Bernaise garlic fries, and while my husband isn’t the biggest fan of sauce of any sort, and he would have preferred these fries not to have Bernaise sauce on them, it was fine. Fries are wonderful nuggets of fried potato goodness after all, and it’s pretty hard to ruin them. My husband, amazingly enough was able to polish off his surf and his turf. he was even kind enough to offer me a bit of his lobster tail, which was nice of him, though I was dying from being so full. 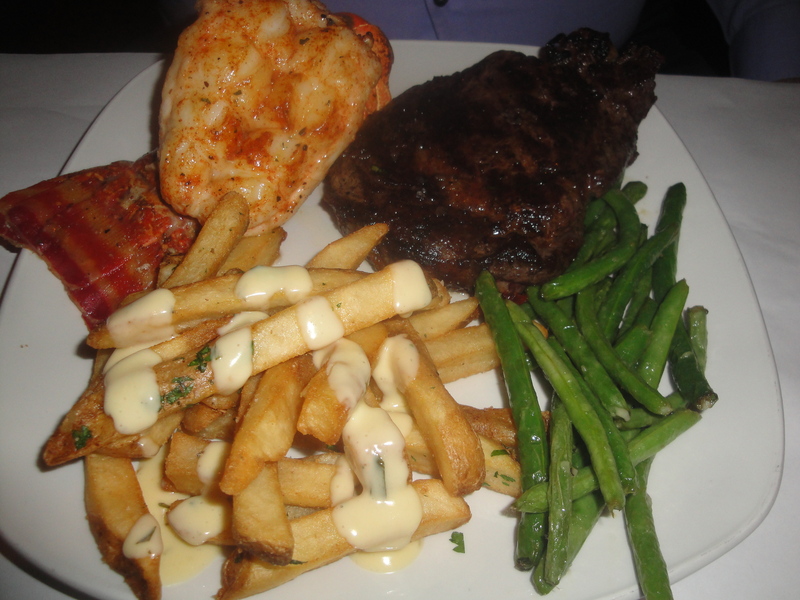 We were both surprised at the size of the lobster tail, as usually in a surf and turf dish, you get a 6 or 8 oz. lobster tail. However, at Portland City Grill, the surf is certainly not forgotten as the lobster tail felt like it was almost as big as the ribeye. And of course, the 36-day aged ribeye was fantastic, you just can’t go wrong with something aged for flavor that long. And ribeye is my husband’s favorite cut of beef. He was more than satisfied with his meal. By the time dinner was done, I was stuffed to the gills. I literally felt like I was going to explode. However, my husband was still interested in dessert. And even though I felt like I couldn’t put another spoonful of food in my mouth, the thought of dessert temporarily perked me up. I’m a dessert kind of girl, and it’s hard for me to turn down any sort of sweet after-dinner treat. So, I told my husband I’d split something with him, though since he’d be eating most of it, he could choose what we ordered, as long as it was something I could eat. 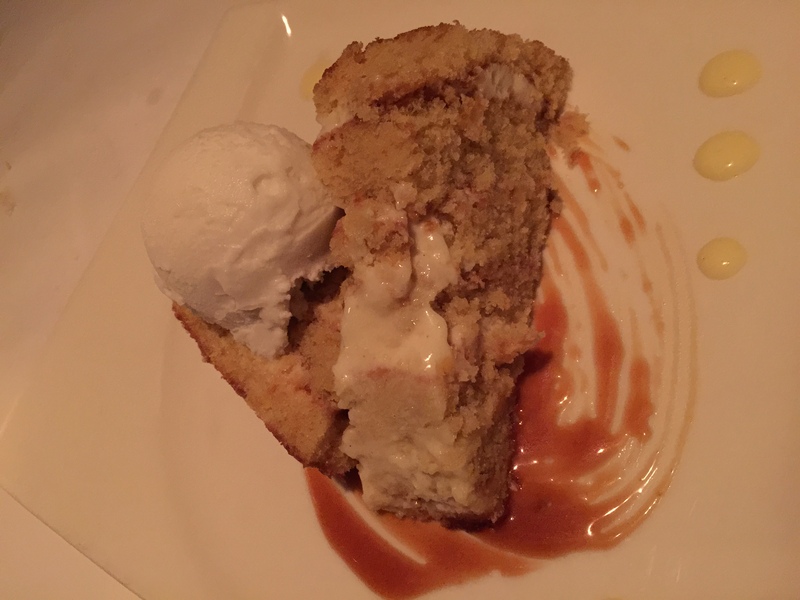 His choice was the 8-layer pineapple cake with coconut sorbet and ginger caramel. Talk about a combination of flavors my husband loves: pineapple, coconut and ginger. An interesting combination, but yet it works because the ginger gives a bit of a kick and helps to balance out the sweetness of the pineapple and coconut. Even though I thought I wouldn’t really be able to eat much of this dessert, I must admit it was so good that I actually ate more than I thought I would of it. The coconut sorbet was fantastic with a very milky, coconut flavor that stood out prominently against the slightly sweetened pineapple cake. But the ginger caramel was the star of the dessert. The ginger kept the caramel from being too sweet as it really mellowed the sweet notes, and the sugar of the caramel kept the ginger from having too much of a bite. The flavors mixed so well together and were a perfect compliment for one another that my husband and I agreed that this was an excellent dessert choice. Dining at Portland City Grill had me running the gamut of emotions. 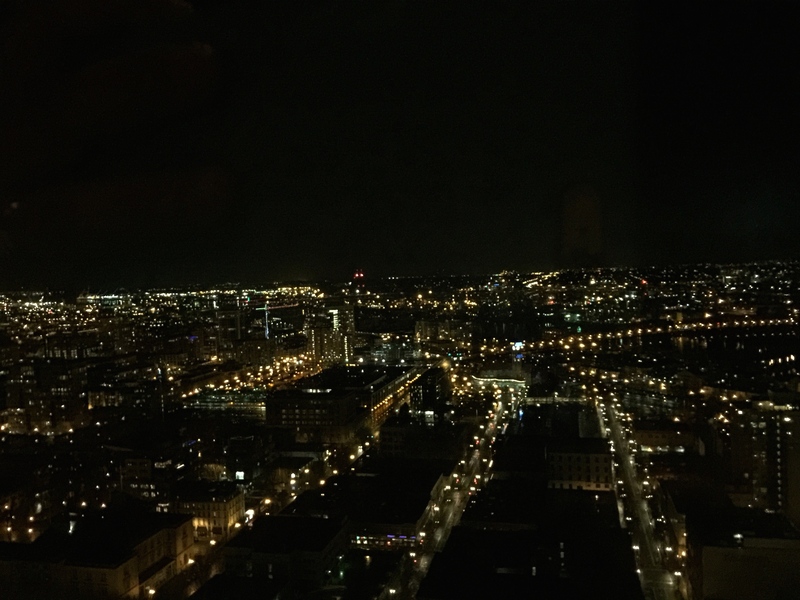 I was initially excited to have a nice meal with a view atop one of the tallest buildings in Portland. But, the wait for our requested window table was really starting to put a sour taste in my mouth even before we were seated as it seemed like such a ridiculous wait. However, by the end of the night, I was stuffed to the gills enjoying the great food and appreciating the fantastic scenery for which I was forced to wait for. Overall, the experience of dining at Portland City Grill in my mind outweighed my dissatisfaction with the length of the wait I went through in order to get the table we wanted to sit at. The food was excellent, and incredibly filling. Simple meals, classic favorites, well cooked and well prepared. Portland City Grill was a great cap off to our wonderful Christmas trip to Portland.